Hailing from Fontana, California, Blackmon enjoyed a celebrated high school career. Rated a 4-star recruit, Blackmon was considered the #23 best player in the country and the #2 best WR by ESPN.com. He played in the 2011 Under Armour All-America game, producing one of the games top highlights with a 58-yard touchdown reception. He committed to play college ball at the University of Oregon. Blackmon never found his stride as a Duck, and decided to leave school. He played one season at Riverside City College, a junior college, before committing to join good friend and star RB Jamaal Williams (Packers) at BYU. 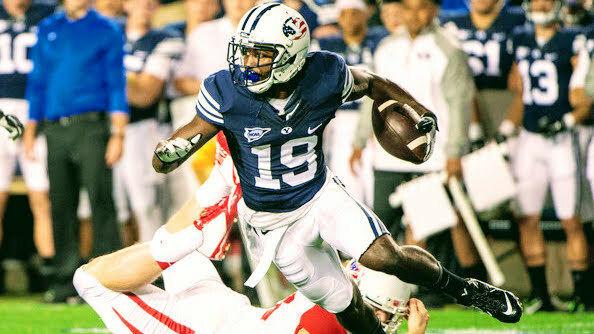 At BYU, Blackmon tallied 799 receiving yards, second on the team, and was named to several All-Independent teams. He also contributed on special teams, adding 265 return yards (29.4 avg). The 6’0″, 186 lb WR also had a good showing at his Pro Day, running a 4.51 4-yard dash, a 32-inch vertical, and a 9’7″ broad jump. In 2018, Blackmon will turn to The Spring League to revive his NFL prospects and prove to scouts his circuitous route gave him the perspective and maturity to succeed in NFL.